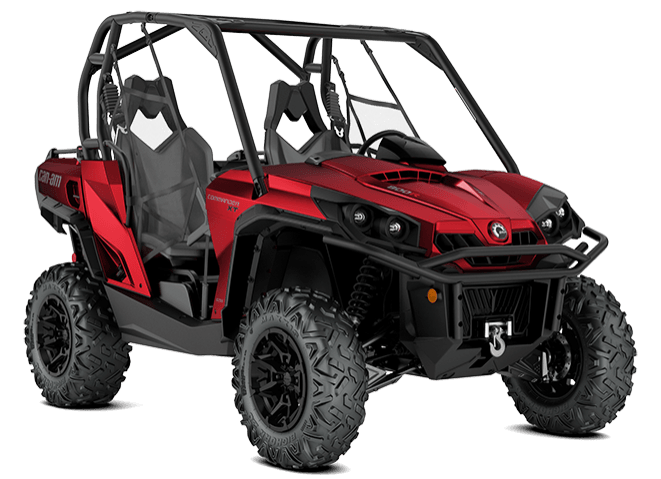 Loaded with features and technology that take value to a new level, the Commander XT is built with best-in-class power, a versatile dual-level cargo box, and rider-focused features perfect for the job site or the trails. ROTAX V-TWIN ENGINE OPTIONS: Available with the 71-hp Rotax 800R or 85-hp Rotax 1000 liquid-cooled V-Twin engines with four valves per cylinder and single overhead camshafts featuring twin fuel injectors that optimize fuel delivery into the combustion chamber for powerful, yet precise performance. DUAL-LEVEL CARGO BOX: The industry’s most versatile and usable cargo box design has a 600-lb (272 kg) cargo capacity, dual storage levels, anti-rust box and tilt-assist dumping. Cargo box with two levels separated by a removable, water-resistant panel that offers an upper and lower bed with their independent tailgate. TRI-MODE DYNAMIC POWER STEERING: The Tri-Mode Dynamic Power Steering (DPS) offers three levels of rider-adjustable steering assistance that can be adapted to match the terrain while also reducing kickback to the steering.The amount of assistance varies with the vehicle's speed to adjust the steering input effort to a comfortable level. 27-IN MAXXIS† BIGHORN 2.0 TIRES ON 14-IN WHEELS: The lightweight radial tires offer a smoother ride, predictable cornering and optimum climbing confidence. Installed on redesigned cast aluminum wheels featuring a strong lightweight construction. HEAVY-DUTY FRONT BUMPER, BED RAILS & MUDGUARDS: Heavy-duty front bumper for a beefier look and functionality. Bed rails installed on the Dual-level™ cargo box add more tie-down points for cargo carrying. Plus, mudguards create an extra layer of protection for the occupants. 4,500-LB (2,041 KG) WINCH: Can-Am chose a premium winch kit for the ultimate performance and durability. The 4,500-lb winch includes dash control and roller fairlead.